The Catholic Archbishop of Abuja, John Cardinal Onaiyekan, has said in spite of the series of meetings and engagements with relevant stakeholders, the Acting President – Yemi Osinbajo lacked the magic to stop the current Biafra agitation and other tension in the country. 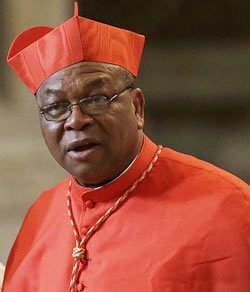 Onaiyekan stated this at a Mass to mark the Centenary of the Late Eminence, Ignatius Cardinal Ekandem, the first Episcopal Archbishop of Abuja Catholic Metropolitan in Abuja. He further maintained that the unity of Nigeria was not in the capacity of any political, traditional or religious leaders to determine but the people of Nigeria. The cleric urged the people to shun those who were beating the drum of disintegration and chaos, saying they always run abroad to hide when the thing go out of hands. Onaiyekan admonished the federal government to refrain from gagging or preventing people from protesting against bad governance, as they had the right to voice out whenever they were shortchanged by their leaders. He said the presidency could only calm nerves, adding that only Nigerians could refuse to be used to cause havoc. The Archbishop said: “the Acting President is not God and he has not gotten the magic to stop all agitations. “He can of course take position; make statement that will calm nerves and encourage those who are working for peace and tranquility. I think he is making effort in that direction, but it depends on all Nigerians. The point I have always made is that it is the ordinary Nigerian who will decide whether we should live together or not. “The people on top when they start playing their game sometimes they even forget the people on the ground. “We on the ground too, we should remember that when the thing gets hot, there are certain people up there who always find a way out. They pack their family on board, fly abroad and leave the poor people on the ground to suffer. We better think that seriously and not allow anybody to push us into a situation, where there is chaos”. “People are angry and when they are angry, they have the right to say so. Therefore, I don’t think government can stop people from making pronouncement explaining what is annoying them, but in doing that, one should count the consequence of what one says. We have the freedom of speech but cannot say everything. So, let us live together in peace and be patience,” he said. It could be recalled that Onaiyekan had earlier said that expressions of anger and dissatisfaction would continue in the country, because the federal character principle leads to injustice and marginalization.